Normally, I brag about other sellers and their items, but I am proud of this Hipster Bag I designed and have to show it off! These Joel Dewberry fabrics go well together! This KeetaCollection bag has pockets on the outside that are made to fit cell phones, ipods, or cameras! I find that this bag would be perfect for a trip to the theme park! My daughter begged me to send her a few scraps of fabric because she liked the fabrics so much too! So…she created this Key Fob found at PuppyDogsNPolkaDots out of one of the fabrics that I sent. Hope you enjoy this collection of creative fabrics as much as my daughter and I did! Cute cute cute key fob! Giveaway Time, I KNOW you love the free stuff! Starving College Girl seeks mailing list to increase her business. Help her out! 🙂 This is easy. A drawing for a free key wristlet from www.PuppyDogsNPolkaDots.etsy.com Sign up for the mailing list, one entry. Post on your blog, twitter, etc, email link to cray729@hotmail.com and you will have another entry for each posting. All for the love of the fob! These adorable key fobs are great, but a free one, even better! Another creation from Puppy Dogs N Polka Dots ! 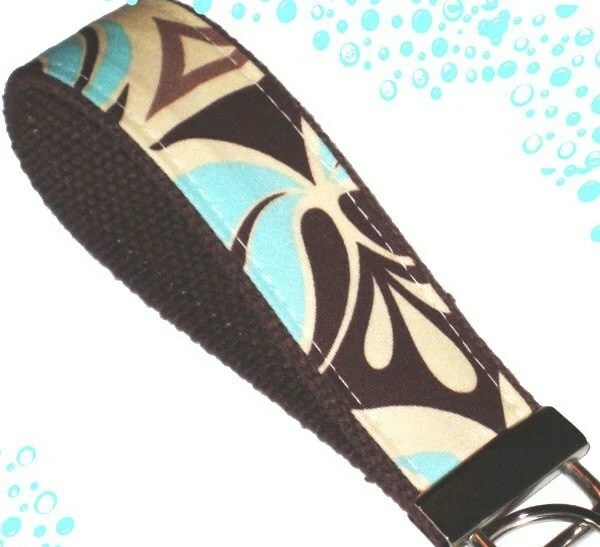 She has been working on belts, dog leashes and dog collars. They are wonderful. I think this is one of the nicest handmade gifts I have seen. Start your shopping for the holidays now! These are one of a kind, and when they are gone….. well you wont find the same one again. This little fob went “free, free, free” all the way home. Maybe to your home? Haha even I am laughing, that has got to be the corniest thing I have ever written! Not that I am trying to push my daughters http://www.puppydogsnpolkadots.etsy.com shop anymore… ok, I am pushing. But she was featured on the prettiest blog. http://www.suaviloquy.blogspot.com AND its a free giveaway. Go in and look around and leave a comment and maybe you will win! There is something so pretty and serene about that blog. I am really drawn to it. Open for business! Let me brag about my daughter just a bit. Corri has opened her own etsy shop, www.PuppyDogsNPolkaDots.etsy.com . She has some adorable key fobs for sale. Her story is one of a hard working girl. When she was 15 she worked over the Christmas holidays at the seasonal outdoor ice skating rink (yes! In Florida!! How fun) Then when she turned 16 she worked at a local grocery store saving up money for college. Summers and school breaks were spent working long hours. Once she left home for school she found a job near her school at the same grocery chain. Recently Corri obtained an internship with the American Lung Association. She is loving every minute of her new job. She hopes to work for a non-profit in the future. Sadly her job at the grocery store had to come to an end. (yes, my little weekly reports of current sales and great bargains has ended too) The mixed hours of school and interning left very little blocks of time for a regular job. Not a girl to sit idle, Corri began making key fobs. They are adorable, in fact I had to go into her shop and purchase one before it was gone. She is hoping to sell enough to make a little gas money to keep her afloat. So if you need a cute little gift or like me, want one for yourself, click over to her store and see what you think. They are a bargain at under $6.00. www.PuppyDogsNPolkaDots.etsy.com I am making my Christmas list now!